AGPS and Location Tracking -- Unlike normal GPS technology, Double position technology based on AGPS that can achieving faster and more accurate to locat tracking of kids. SOS founction is more effective to get call if they in danger. Parents can controll and settings via app to track information of kids. Remote Voice Monitor -- Support setting the voice monitor number in App and dail the number, the watch will automatically answer without remind. Parents can track children's information and explore their surroundings even when the child is in danger. SOS Emergency Call -- Setting emergency function that press SOS Key for 3 seconds in any model,it will call 3 SOS phone numbers alternatively in 2 rounds until answering the call. Certainly for emergency situation. Fun Gift -- More functions and built-in Lbs location,Phone book,Talk-back,voice chat,watch alarm clock,Love reward,Flashlight,Looking for watch,Map,SOS emergency alarm,etc. Best gift for Children when birthday and holiday. 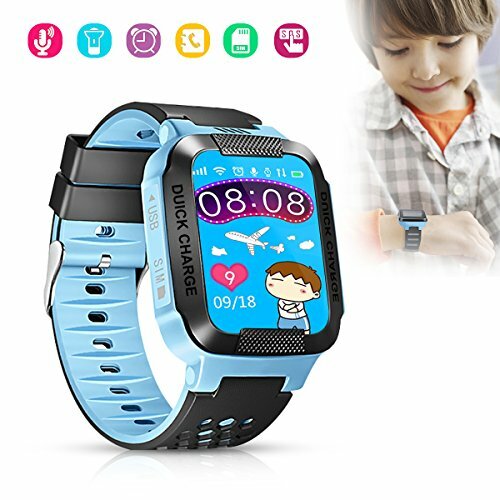 Forbidden Function -- Parents can set the forbidden time while class time.The watch features are not available when the kids is in class time to ensure the normal order of the school.